SAN DIEGO – The San Diego Padres today announced details for 2019 Padres FanFest taking place on Saturday, January 12, at Petco Park from 10:00 a.m. to 3:00 p.m. Admission to Padres FanFest is free, with fans required to redeem entry tickets at www.padres.com/fanfest. Fans may claim up to eight (8) complimentary tickets for the event with a ticket required for entry through the MLB Ballpark app. Gates for Padres FanFest will open to the general public at 10:00 a.m., with fans able to enter through the Home Plate and East Village Gates. Padres Season Ticket Members will receive exclusive early access to FanFest beginning at 9:00 a.m. through the dedicated Member Entrance at the Home Plate Gate. Parking is free of charge and available on a first-come, first-served basis in neighboring Padres-owned lots, including Lexus Premier Lot, Tailgate Lot and Padres Parkade, with spaces expected to fill quickly. Padres Members may redeem one complimentary parking pass in advance through their online My Tickets account to be presented on the day of the event. Padres FanFest will feature various interactive experiences, including KidsFest activations with bounce houses, games and face painting, access to the wiffle ball field, the Military and First Responder Zone, the Padres Hall of Fame presented by Sony, the Breitbard Hall of Fame and The San Diego Section of CIF Baseball and Softball presented by FOX Sports San Diego located in Section 114. Select concessions will be open on the Main Concourse along with a Taste of Petco Park sampling during the event. In celebration of the 50th anniversary of the San Diego Padres, the visiting clubhouse will feature locker exhibits and appearances by various Padres alumni. 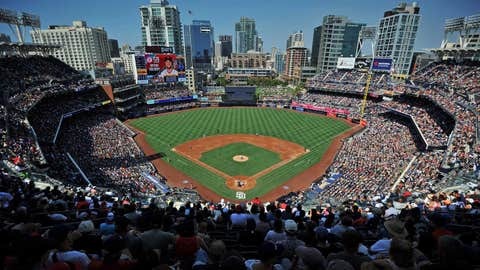 Returning to Padres FanFest in 2019, fans will have the unique opportunity to participate in various activities on the playing field at Petco Park. In addition to Fans Run the Bases, attendees will be able to play catch in right field, catch fly balls in center field, throw three pitches in the visitor’s bullpen, have their photo taken at the left field wall and view the Grounds Crew field maintenance equipment. Other elements of the day will include the Home Run Derby VR Experience presented by HP, the Rocket League gaming area presented by Psyonix and the Sony Experience gaming area located in the Padres ’47 Brand Team Store. Select Padres gear will be on sale in the Padres ’47 Brand Team Store, Palm Court Plaza and in various portables around the ballpark. Padres players, alumni and broadcasters will be available to sign autographs from 10:00 a.m. to 2:00 p.m. at three designated locations around Petco Park. Autographs are available on a first-come, first-served basis and are not guaranteed. Fans will also have the opportunity to see Padres players, coaches, alumni and broadcasters on stage from 11:00 a.m. to 1:00 p.m., including a Player Pictionary competition. Returning in 2019 is the fan-favorite Padres Foundation Garage Sale located in the Park Blvd Gate Plaza, featuring memorabilia, game-used player jerseys, batting helmets, one-of-a-kind Padres items, collectibles and more. All proceeds from the garage sale will benefit the Padres Foundation’s charitable efforts. Standard Petco Park security and screening procedures will be in place for Padres FanFest. Re-entry to the event is permitted, though fans who exit will be screened upon re-entering the ballpark. Information about Padres FanFest, including maps, schedules, exclusive giveaways and further details can be found in the MLB Ballpark app. Fans are encouraged to download and familiarize themselves with the app prior to attending the event. Please visit www.padres.com/fanfest for additional details and the most up-to-date information.